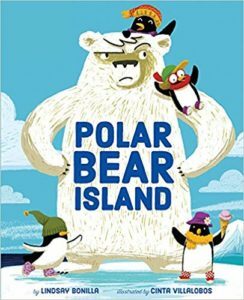 Happy Book Birthday to POLAR BEAR ISLAND by Lindsay Bonilla! Lindsay Bonilla’s timely picture book POLAR BEAR ISLAND came out October 2nd with Sterling! Welcome to Polar Bear Island. NO OTHERS ALLOWED!” Parker is the mayor of this peaceful, predictable island, and he wants to keep it just the way it is. But Kirby, a penguin, thinks the place is paradise, and she wants to stay. Parker says no, but the other polar bears love Kirby —and soon they’re begging Parker to let Kirby (and her family) move in. Will Parker agree . . . and make the island fun for EVERYONE? With its gentle message of inclusivity, this playful and lighthearted story will delight children. You can order through Barnes & Noble, Amazon, IndieBound or Target. Lindsay Bonilla performs interactive folktales for her company, World of Difference Ltd., and teaches children about foreign countries and cultures. She lives in North Canton, OH, with her husband, sons, and rescue dog. You can follow Lindsay on Twitter or go to her website! Check out my interview with Lindsay here!